Thar Gyi is a contrarian at heart. He describes his current art practice, which explores the subtle shading and toning created by the application of closely spaced ridges of paint across the canvas, as “non-paintings”. He wanted to get away from depictions of familiar subjects, and create something that is inward looking – concerned with internal rhythms and chromatic harmony. The initial inspiration for this series of artworks was on a trip with a group of friends to Bagan, Myanmar’s temple area. They clambered up onto one of the pagodas at sunset, and while the others were photographing the setting sun, Thar Gyi was looking in the opposite direction, noticing the shadow that the pagoda was casting over a newly ploughed field, and the deeper shade between the ridges of earth. This scene lodged in his artistic imagination and started him creating these spare and subtly nuanced works. Over time he has stripped away the dark colors of the shadow, generally using warm or neutral tones. Some of his artworks include barely perceptible silhouettes of figures in the background, underneath the ridges of paint, suggesting human life far in the distance – or in the past. It is almost as if they are gesturing to us not only across space, but also across time itself. In the context of Burmese painters, Thar Gyi is unusual in his attraction to the abstract; and his predominate use of light or neutral tones. In amongst the great swathes of tropical color in the dramatic landscapes or portraits of his peers, his works stand out as quietly reflective, rewarding longer contemplation. 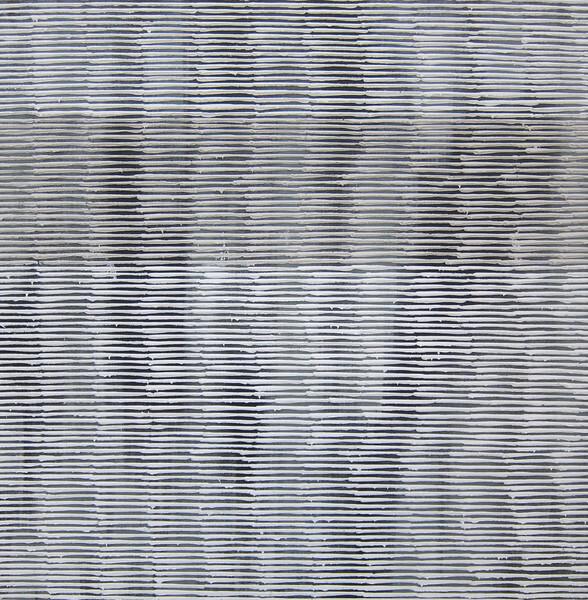 Thar Gyi, The Shutter (1), 2013. Acrylic and oil on canvas, 30 X 30 in.